RF Co. Ltd. (www.mywindowmate.com), founded in 2014 to specialize in window cleaning robots, has developed and is now selling ‘Windowmate’, the world’s first window cleaning robot that remains on the window even when power becomes unavailable, thanks to its permanent built-in magnet. These window cleaning robots can be used not only in private homes, but in places of business such as hotels, restaurants, coffee shops, where their high utility are pointing to promising commercial prospects. ‘Windowmate’ uses powerful neodymium magnets to fix itself onto both sides of a window. Once fixed into place, the window cleaning robot will recognize its location relative to the window frame and automatically clean both sides of the window at the press of a button. 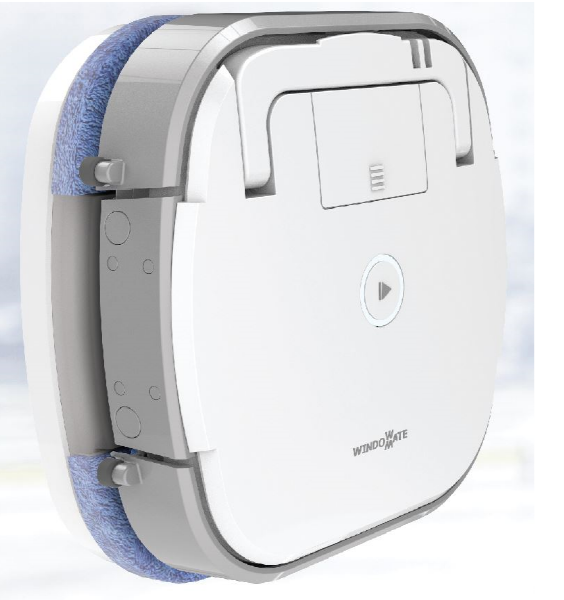 Unlike the vacuum suction systems in foreign-made window cleaning robots, Windowmate is the first of its kind in the world to have a permanent built-in magnet, which eliminates the risk of the robot detaching and falling even when the power is turned off accidently by an exterior impact force or battery drain. After fixing to both sides of the window and pressing a button, the robot will automatically calculate the width and height of the window and proceed to clean the window using a self-driving method. Using four sensors – ultrasonic, accelerometer, contact, and magnetic – the robot is able to recognize and control its position to clean the window without missing any spots. Once the window is meticulously cleaned, the robot returns to its starting position. The easy removable cleaning pads can be washed and reused as demonstrated by the company’s strict quality control process of undergoing 300 washing tests. The pad is made of 35,000 strands of ultra pure microfiber/㎠ for complete removal of dirt from the glass surface. The design is curved, modern, and simple and is offered in sophisticated colors ranging from midnight blue, white, cherry brown, and gold. The lineup for the Windowmate RT series consists of four products that are appropriate for different thicknesses of the windows: RT10PW (5-10mm), RT16PW (11-16mm), RT22PW (17-22mm), RT28PW (23-28mm). The company recently added a new function: smartphone and Bluetooth connectivity. By applying a Bluetooth low energy 4.2 compliant module, users can download an app, through which they can check on the status of the battery as well as to remotely control the product. Product information (specification and usage) through the smartphone app can be verified, and thickness of the windows can also be checked. The standard lineup of products make direction changes through window frame recognition, but the company has showcased a new product that can even clean windows that aren’t framed. By using the non-contact sensor, the robot automatically recognizes the end of the glass, and, using algorithms that move the robot in the opposite direction, the robot is able to complete the window cleaning task even for frameless specialty windows. As a result, it is now possible to clean the frameless windows often found at airports and shopping malls. The company’s overseas exports alone are expected to reach over 70,000 units this year. Although RF’s export market has been largely dominated by Japan, the company plans to expand into the United States, Europe, and the Middle East. To this end, the company is actively participating in CES, IFA and other international exhibitions, with tangible fruits of their labor. Other than their window cleaning robot Windowmate, the company is working to diversify its product line with robot window cleaners for large glass buildings.